Learning German is now a lot more popular than it was a couple of years ago, and there’s plenty of schools and colleges that teach it. For those of you not in college but still looking to learn the language, here are the best German coaching classes in the city. The top spot on this list has to be the Goethe Institut in Nungambakkam. Recognised by the German government, all german courses here end with a certificate awarded to you that shows your level of understanding. Courses are split up by duration and intensity of study with there being three options: Extensive (16 weeks), Intensive (12 weeks) and Superintensive (5-6 weeks). Their individual sessions are 45 minutes long and their batch sizes are around 15-20. What’s more, they host international film festivals! This Adyar born language school has been around for more than a decade and has been one of the best places to learn German if you’re from South Chennai. With centers now in Anna Nagar, Kilpauk and Nungambakkam, it’s not just South Chennai that benefits. INaWORD aims to get you functionally proficient in the language by training your German reading, writing, listening and speaking skills. Their highly rated classes are made to be interactive and are in small groups of 10-15. They offer short term crash courses (10 hours a week of coaching} and slower long term courses (5-6 hours of coaching). Their schedules are flexible too which is great for when you have a day job. So go now and learn some German! If Goethe Institut is the gold standard of German understanding, Sprachilingua aims to get you functionally ready to be in Germany. This tiny academy in T-Nagar focuses on teaching you how to speak and converse confidently in German. So much so that they do away with books entirely! All classes revolve around interactions and video sessions and cover topics that are relevant today (like how do you talk to the visa officer after you land, etc). Their hour long classes have flexible timings and class sizes are kept to around 10-15. Similar to Sprachilingua, VLC Language Center is a functional styled approach to learning German that’s aimed at students and young adults moving to Germany. Speaking, basic reading and communication is what they focus on and their hour long classes come with all the reading material you will require. Their full time staff have been teaching German for a decade now and that’s why we think that this is a quality place to learn German. FITA, (Focus’d IT Academy) is a language and IT training academy that handles more students than all four other entries on this list. 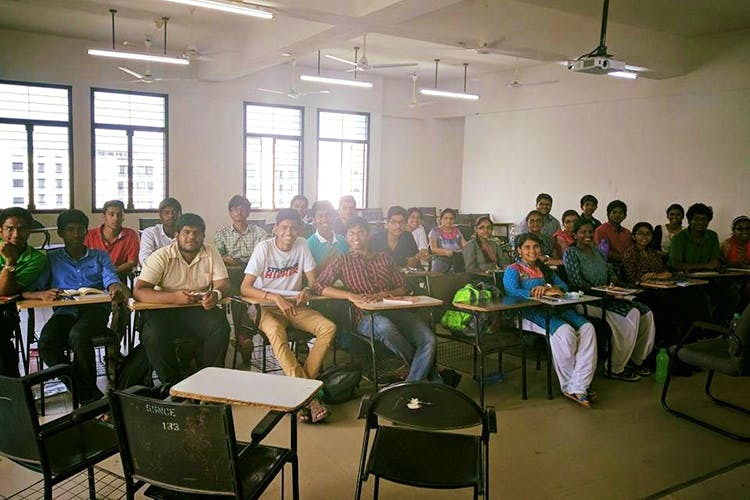 Their German classes take place at their branches in Velachery, Thoraipakkam and T-Nagar, what’s more is that they’re the only entry on this list with a specially designed online German class. Similar to Goethe Institut, FITA also follows the German government stipulated levels of German proficiency and course duration and length varies on the difficulty of the course. Their speaking, writing, listening and reading modules are coupled with an extra fifth that we think is a great value add, and that’s cultural aspects (that you need to know if you’re interacting with German people).